It Is Necessary To Learn To Read Sheet Music As A Guitar Player? Learning how to read music seems to be an emotionally charged topic for guitar players. Some guitarists say that if you can't read music then you are not a 'real' musician. Other guitarists say that reading music is completely useless for a modern guitarist. Other still take a middle-of-the-ground position and say that reading music is a nice skill to have but not necessary. The reality is that those guitarists are all correct: they are talking from their own different personal experiences. But that does not mean that their experience will apply to what you want to play on your guitar. 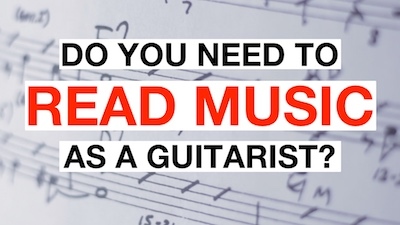 So the real question is: do YOU need to learn to read music? Is it going to be useful for you or just a waste of time? As you see, reading music is a tool like many others, and it makes sense to learn it if you are going to use it. I hope that the examples I give in the videos are useful for you to decide if you need to learn standard notation - and until next time, enjoy! To learn music theory whether you can read sheet music or not, have a look at the courses Complete Chord Mastery (for chords, progression, and rhythm guitar) and Master of the Modes (for scales, modes, and lead playing). All examples in those courses are played and transcribed in both standard notation and tablature - and all the concepts behind them are explained so you will be able to create YOUR music too!